Ford came late to the muscle car game. While Pontiac GTOs and and Plymouth Satellites with big block engines were tearing up the streets in the mid 60s, Ford's only comparable models were the Fairlane and the Mustang. But few Fairlanes were sold with Ford's 390 c.i. V-8, and the Mustang was based on the old lightweight Falcon chassis and was not really a suitable platform for a performance car. 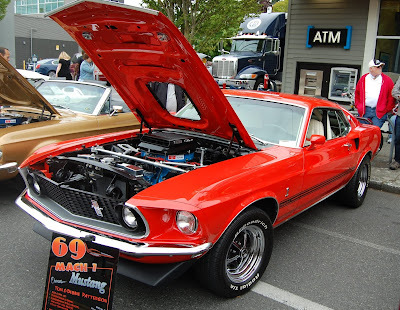 The 1969 Mustang was a bigger car with serious muscle options. The Mach 1 package made the Mustang a contender on the drag track, while the Boss 429 was engineered for NASCAR.